What can the U.S. learn from Copenhagen about use of 'placemaking' to foster healthier, more inclusive communities? Opportunities for outdoor recreation--biking, swimming, dancing, trampolining--are plentiful and woven into the city streets, not reserved for parks and playgrounds (although Copenhagen has lots of those too). 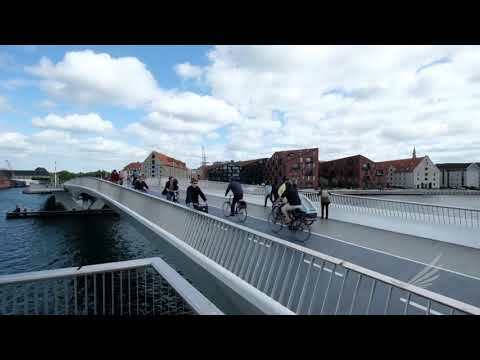 These snippets illustrate how Copenhagen’s public places reflect its societal values. Looking at the city today, it’s easy to conclude that it was always like this, but it wasn’t. Copenhagen has been on a remarkable journey—a journey that can provide inspiration and insight for American cities that are also eager to become more liveable. I visited Copenhagen as part of a contingent from the United States that included public planners, community development practitioners and policymakers. RWJF and the Gehl Institute convened this group to explore what we can learn from other countries about placemaking—designing and using public spaces to promote health, equity and inclusion. The trip gave us an opportunity to reflect on our own surroundings back home and ask: What do our public places say about us? What do we want them to say? It was an eye opening experience and the others that joined me also came away with keen insights that have implications for how we can shape public places here in the United States. The current conversation in America about health focuses on health insurance. We tend to approach health in a compartmental way rather than considering the entire picture and all the multiple facets that intersect with a person's health and well-being. What you see in Europe is that health is just not about insurance. It's about the transport system. It's about community planning and civic design. It’s about building stronger cohesion and social fabric. Copenhagen has created a public realm where a variety of people can interact and engage in activities to create a healthier mental space for individuals and for a community. The integration of play spaces is just one example. It’s not just playgrounds--they have places where people of all ages can access opportunities for physical opportunity. This brings together folks of all ages. So you see families with young kids, but also middle-aged folks out on a jog, or on a bike ride, and the elderly, finding ways to share time in the outdoors and really live a healthy lifestyle. We have a very serious problem in the United States, a systemic problem in the way we build our cities. I was once stopped by a cop for walking—I was only going one mile away and didn’t want to take a taxi. But there was no sidewalk so the cop pulled up and wanted to know what I was doing on the street. Most of the cities in the U.S. are like that. We’re addicted to our cars and always want more parking spaces. Copenhagen’s approach to setting priorities is entirely different. Their goal is to increase the space for people first to be able to walk, then to be able to bike, then to take public transportation, and then for the car. In the U.S., we go in the opposite direction and I really feel this gets to the root causes of some of the problems we are facing as a nation. In many of our cities, working-class families do not have the benefit of public transportation or the possibility of biking. These options have a direct correlation on the quality of life, in your health. The Latino community is largely a working-class community. We lost most of our wealth as a result of the 2008 recession and face very serious challenges to housing, education. We’re also suffering from some of the highest levels of obesity. It was eye opening to see in Copenhagen how public spaces can impact the quality of life of people and affect the way in which we live. Travelling across the United States I’ve met many people who talked about wanting places in which their children can thrive, in which they can play, where there's an open space where they feel safe. But these are opportunities that are not afforded to all ZIP codes within a city. That’s because our infrastructure was built in a way which divides communities. Literally in the concrete you can see values that are post-civil rights errors in which we divided communities on economic and racial lines. As our infrastructure ages, there's an opportunity to really invest in designing spaces in which we can all benefit, we can all play, and we can all enjoy the basic values of life, liberty, and the pursuit of happiness. We often feel like we’re the only people who're dealing with these challenges. But Copenhagen went through a massive reinvestment in the 1970s and because they've already done it, we don't have to do the full learning curve. We get the benefit of learning from people who've already bumped their head, fallen over. We can take those lessons learned so that we don't repeat mistakes and can apply successes in a very quick manner. Public places are critical in a Culture of Health. As we’ve seen in Copenhagen, they can be welcoming, inclusive; they can support civic engagement and they can promote good health. The next time you go for a run or take your child to the neighborhood playground, ask yourself: Is this place open to everyone? Is it safe? Is it comfortable? What do the trash cans reveal? Learn more about global ideas that are informing efforts to build a Culture of Health here in the United States. Karabi Acharya, who has drawn upon her expertise in anthropology, public health and systems thinking in working with the citizen sector in the United States, South Asia, and Africa, joined the Robert Wood Johnson Foundation in 2015. She directs the Foundation’s strategies for global learning. Read her full bio.